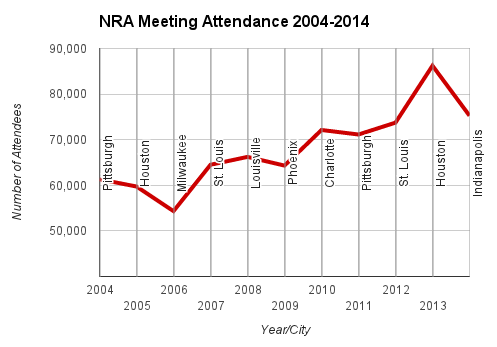 It was reported last month that NRA Annual Meeting was one of the fastest growing conventions or trade shows in the country, but I wanted to provide longer term trend information. 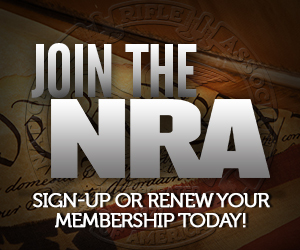 Unfortunately, I found I had a gap in my reports since I started attending NRA’s Annual Meeting and had to wait on the numbers to present an accurate report. I just received those numbers and made a pretty little chart for you all to see how we’ve been trending. Keep in mind that that the bottom line in this chart is 40,000 people, and the lowest attendance documented here is still more than 54,000. While the number of attendees from Houston to Indianapolis dropped, the end of the 10-year span is still reflective of a 23% increase in members coming out. Even within the same city, both repeat cities have seen double digit increases in turnout. That’s pretty impressive. Even within the same city, both repeat cities have seen double digit increases in turnout. Both? According to the chart there are 3 repeat cities, Pittsburgh, Huston, and St. Lois, are there not?